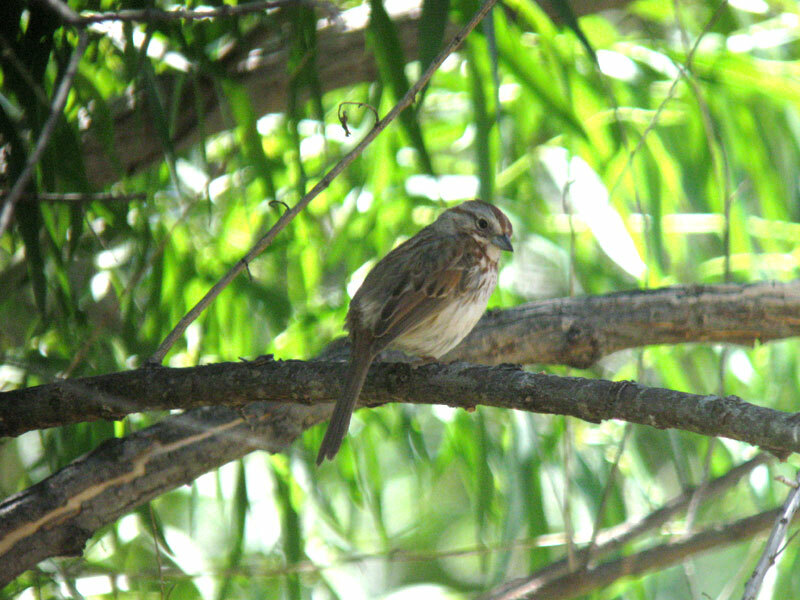 Song Sparrow avoiding the bright sun. Nogales, AZ. 30 Apr 2011. Photo copyright David Sibley. An interesting study published recently found that cowbirds in bright sunlight were slower to detect predators, and cowbirds in shade were quicker. The study concludes that the delay happens because the cowbirds are slightly disabled by the glare of the bright sun. Could this explain why small birds are hard to find in bright sunny weather? Or why they are more active in the shade or on cloudy days? I had never really thought about it much, and just accepted the idea that it was heat-related – that birds stayed in the shade and under cover because that was more comfortable. But the absence of bird activity during the middle of the day can be explained as well or better by a simple predator-vigilance hypothesis. If it’s easier to see approaching danger and stay safe in the shade or on a cloudy day, and they have a choice, birds would be expected to avoid the bright sun glaring down. Might this also apply to flash photography of birds? … that the flash will cause the bird to not see well for at least a short period of time, which could put the bird at risk of predation?